The island of Tenerife has a population of 908,555, with 32,571 people living in the city of Puerto de la Cruz. Tenerife is the largest of Spain's Canary Islands, in the Atlantic Ocean. The island is home to the University of La Laguna, which was founded in 1927 and is the oldest university in the Canaries. Tenerife has two international airports. Known as "the island of eternal spring", Tenerife has a 27°C average yearly temperature. A mountain range cuts right through the centre of the island. There you will find El Teide, Spain's highest peak, which offers stunning views the area's rich natural landscape. 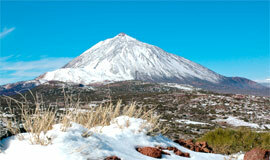 El Teide itself is also a UNESCO World Heritage Site. The beaches in Tenerife have a world-wide reputation for soft, clean, gold or volcanic black coloured sand. Loro Park is one of the island's most visited sites, with beautiful botanical gardens, Europe's biggest penguin aquarium and other exciting attractions. The world famous Carnival of Tenerife is a carnival all over the island, and includes murgas, comparsas, rondallas and other musical groups, as well as unofficial festivities that supliment the atmosphere of the offical celebration. 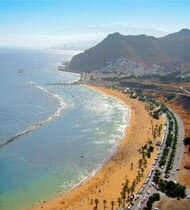 Tenerife is an Atlantic paradise, with scuba diving and windsurfing amongst other leisure pursuits practised here. 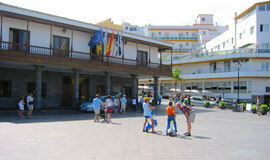 Puerto de la Cruz is a popular tourist destination, and unlike the large resorts in southern Tenerife, Puerto de la Cruz is renowned as a wonderful place for relaxing. While Puerto de la Cruz may not enjoy all the advantages of a big city, it still has excellent cafes and restaurants, a variety of attractions and many other facilities that add to its vibrant atmosphere. Tenerife can be conveniently accessed by its two international airports, or its excellent sea connections. There are daily flights from Madrid, as well as other prominent parts of the Iberian Peninsular, and even from further afield in Europe. Travel to other Canary Islands is easy from Tenerife, which offers both frequent ferry services and flights to the rest of the archipelago. Tenerife enjoys a year-round mild climate and fresh sea air, making it not only a great holiday destination, but the perfect place to study Spanish. The island's economy is made up mostly of its tourist infrastructure, as well as its natural resources. The sea provides Tenerife with a fantastic cuisine, full of seafood and delicious vegetables. The lush vegetation of the island contributes to its relaxed atmoshere, with its many parks and open air restaurants. Streets near the Plaza del Charco and the promenade have a huge choice of cuisine. Puerto de la Cruz also has buildings of artistic and historical value, such as la Ermita de San Telmo, the church of Nuestra Señora de la Peña, la casa de la Aduana and el Castillo de San Felipe. Lago Martianez is one of Tenerife's most popular attractions, where seawater pools provide a beautiful place for sun bathing and relaxing, surrounded by the best of Tenerife's architecture and exotic volcanic coast plant-life. Furthermore, Puerto de la Cruz enjoys many smaller volcanic sand beaches like Playa Marianez and Playa Jardin. Nature lovers are strongly recommended to experience Loro Park and the botanical gardens, both situated just outside of the city. The gardens, which date back to 1788, feature a rich variety of plants and trees from every part of the world. This is preserved by Tenerife's beautiful climate. Loro Park has the world's largest collection of parrots, an exciting parrot show and a dolphinarium. Tenerife's annual Carnaval festival (which occurs sometime between Feb. and Mar.) is second only to Rio de janeiro's Carnaval as the most celebrated in the world. Although festivities go on all over the island, those happening in Santa Cruz and Puerto de la Cruz are particularly famous for their lively atmosphere. Tourists and locals alike participate in the processions, parades and performances that enliven the streets with singing, dancing and exciting fun. A Carnaval Queen is also selected each year along with her court. The curious tradition of the Sardine Burial, or Entierro de la Sardina, takes place in Puerto de la Cruz, where observers watch a fake sardine being buried. The event symbolizes the start of Lent.